What exactly is a mum jean? I’m sure most of us have an idea, but they can be easily mixed in with the many types of jeans floating around right now. 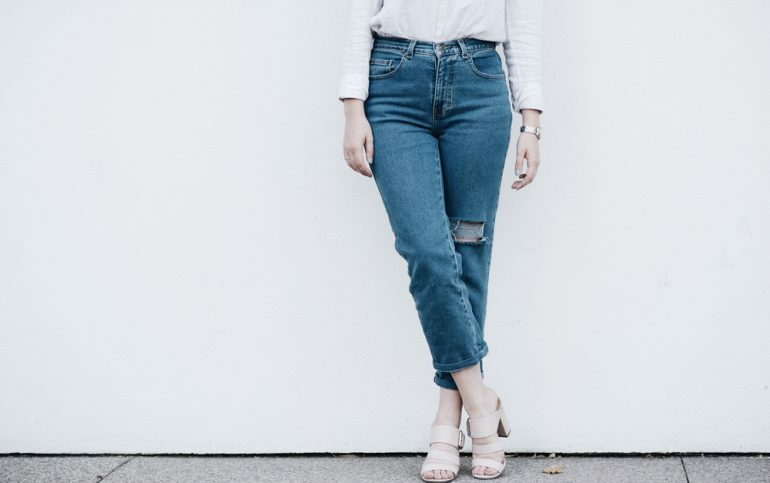 Mum jeans are extremely high waisted, tapered in the leg, and decidedly a bit frumpy. They hug the hips perfectly and are more relaxed than a classic skinny jean. They’re reminiscent of the ’80s and ’90s — think Monica in Friends relaxing at home in her huge West Village apartment. They go perfectly with a big statement belt and, the best part, essentially anything else. Part of the lure of mom jeans is that they’re easily dressed up or down. Add a blazer, a sharp white tee, a pair of heels and a beaded clutch and you’ve got a business dinner outfit. Or, pair with a gorgeous blouse, low-heeled shoes and a double breasted trench coat, and you’re ready to fashionably jaunt about town. Personally, I love the mum jean with a faded band t-shirt, that infamous double-G belt, and a pair of Vans. It’s got that laid-back, cool-girl-on-a-Sunday feel. The relaxed fit of these jeans make them super comfortable and extremely versatile. The best thing is they can literally be worn for any occasion so investing in a couple of pairs in different shades of denim, or maybe even a nice charcoal grey, would not be a bad idea. These can even be worn throughout the Spring as the mercury begins to rise and never go out of fashion so they can be used the year after and many years after, jeans begin to look even cooler the more vintage they become in my opinion. If you’re on the hunt for a new pair of jeans then maybe go for a change from the run of the mill skinny jean and give this more relaxed, cool fit a chance instead. Next articleFestive Knitwear? Yes or no? ?